As reported by Bloomberg, Mozambique will be the country in Africa that will experience the fastest increase in the number of dollar millionaires over the next decade. They will be followed by countries like Ivory Coast and Zambia. This exponential increase in the number of dollar millionaires is being driven by a mix of construction, financial services and property development. The number of people with net assets, excluding their primary residence, of more than $1 million will surge 120 percent in Mozambique by 2024 to 2,200, Johannesburg-based research company New World Wealth predicted. The number of millionaires in Ivory Coast will jump 109 percent to 4,800 while those in Zambia will double, the company forecast. “High net worth individual numbers are expected to rise by 45 percent over the next 10 years, reaching approximately 234,000,” New World said in the report, given to Bloomberg. The economy of Mozambique is being boosted by the biggest natural gas find in the world in the last decade, Ivory Coast is recovering from a civil war and Zambia’s rich are expected to benefit from real estate development. The countries will take over from oil producers Angola and Ghana, where the number of millionaires rose more than fivefold between 2000 and 2014, according to New World. 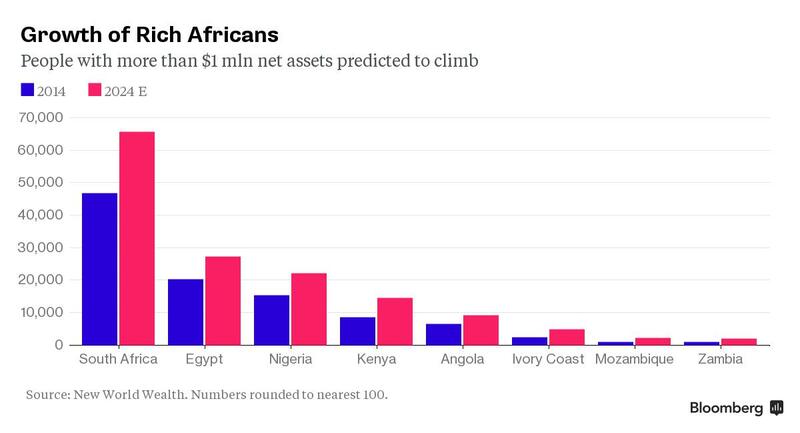 Over that period, the number of millionaires in Africa rose 145 percent compared with a global average of 73 percent. The gross domestic product per person of Mozambique was $619 last year, according to the World Bank, ranking it just after Togo and among the 15 poorest sub-Saharan nations. While South Africa, with 46,800 millionaires, and Egypt, with 20,200, remain Africa’s biggest wealth centers, growth in the numbers of the rich have been held back by emigration from a stuttering economy in South Africa and instability in Egypt. Still, South Africa is expected to remain home to most of the continent’s wealthy, with their numbers rising 40 percent in the next decade to 65,700. About $120 billion in African wealth is overseen by asset management companies, with Investec Ltd. holding the biggest market share followed by Rand Merchant Bank and UBS AG, New World said. The African private banking market is forecast by the research company to grow 8 percent annually over the next decade.